ein hod: Burn, Baby, Burn: A Book Funeral? Tom Wayne amassed thousands of books in a warehouse during the 10 years he has run his used book store, Prospero's Books. His collection ranges from best sellers like Tom Clancy's "The Hunt for Red October" and Tom Wolfe's "Bonfire of the Vanities," to obscure titles like a bound report from the Fourth Pan-American Conference held in Buenos Aires in 1910. But wanting to thin out his collection, he found he couldn't even give away books to libraries or thrift shops, which said they were full. 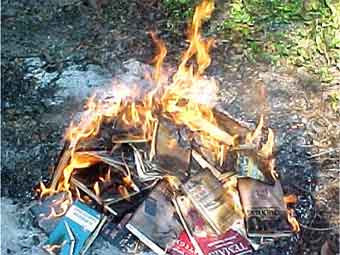 So on Sunday, Wayne began burning his books protest what he sees as society's diminishing support for the printed word. "This is the funeral pyre for thought in America today," Wayne told spectators outside his bookstore as he lit the first batch of books.The fire blazed for about 50 minutes before the Kansas City Fire Department put it out because Wayne didn't have a permit to burn them. Wayne said next time he will get a permit. He said he envisions monthly bonfires until his supply estimated at 20,000 books is exhausted. "After slogging through the tens of thousands of books we've slogged through and to accumulate that many and to have people turn you away when you take them somewhere, it's just kind of a knee-jerk reaction," he said. "And it's a good excuse for fun."